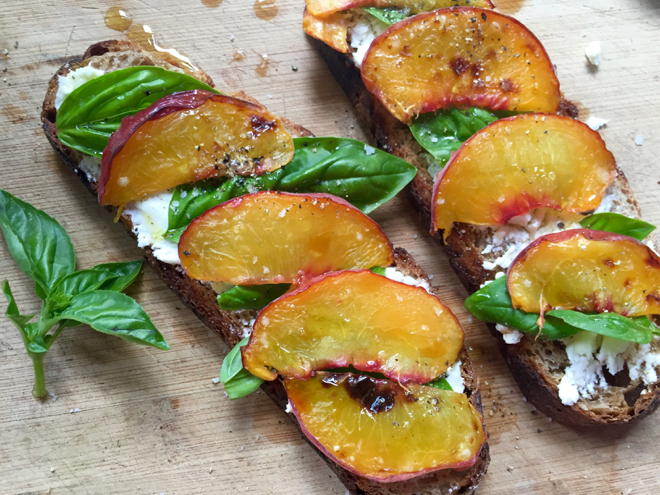 It’s been a terrific summer for peaches – some of the tastiest I’ve eaten in years. I’ll try this one- it looks delicious. Thank you! I’m surprised you haven’t been mugged walking around with all that delicious food! These looks wonderful–I’ve had them with blue cheese as well. Really good! I’m thinking of you–take care. Ha! That’ll be the day:)! YUM. The peaches here in Cali have been insane, so insanely good I’ve been tempted to blog about them myself. : ) I’ll try this instead! Yet another reason I’m still sad I moved off the block! On another note, you’d be happy to know I’M cooking all those recipes you taught Adam. Bait and switch, I tell ya! Hurray! Happy cooking. . . and thanks for your note.